Two new appointments have been made at an expanding Shropshire law firm. 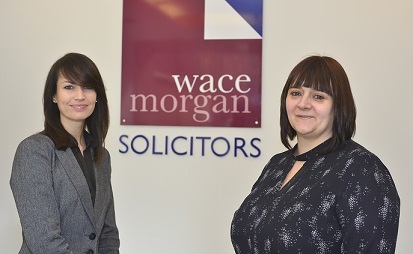 Melissa Dyke joins the conveyancing department of Shrewsbury-based Wace Morgan Solicitors as a licensed conveyancer, having previously worked at law firms for over 18 years in the Stafford, Wolverhampton and Telford areas. She qualified as a licensed conveyancer in 2008 and specialises in residential sales and purchases, Help to Buy transactions, transfers of equity, registrations and adverse possession applications and re-mortgages. “I am very pleased to have joined such a busy and well-respected Shropshire law firm,” said Melissa, who lives in Broseley Wood. Wace Morgan’s other new recruit is Emma Jacobs from Wrexham, who studied for a law degree at the University of Liverpool before completing the legal practice course at the College of Law in Chester, gaining a distinction. She previously worked at a multi-office law firm covering Shropshire and north Wales, qualifying as a solicitor in 2011 and going on to carry out private client work, specialising in will preparation, estate administration and dealing with tax and trusts. Emma is a technician member of Society of Trust and Estate Practitioners, having completed additional qualifications in administration of estates and trusts since qualifying as a solicitor.